Nasubi and Karauri talk about the importance of underwear while cleaning the bank of the Sanzu River. Hozuki goes to supervise them, and while Hozuki and Karauri are distracted discussing about several belongings spread all long the river, Nasubi sees the culprit. A giant crab who is attacking people. Hozuki and Karauri only discover it later when they see a report on television about the crab. Satan, the European King of Hell, visits the Japanese Hell while secretly plans to spy and later dominate it. 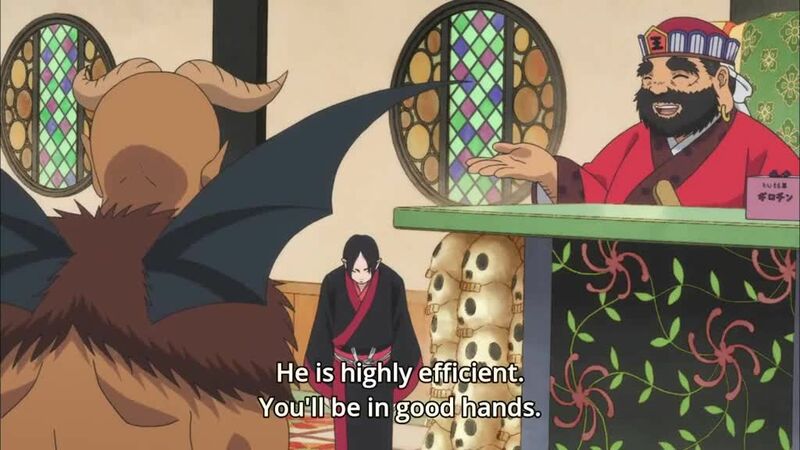 While on a tour through the Hell accompanied by Hozuki, Satan gets scared by Hozuki for the way he treats Enma. Satan also gets astonished to have to eat goldfish plants; he ends up liking the culture shock. However, Satan runs away from the Japanese Hell when, while spying Hozuki’s room, sees that Hozuki needs a “Satan” to create a panacea. When Satan leaves, Hozuki notices he wrote “Santa” wrong.